If you love your sweaters with style there is no reason in the world not to check out unique fashion sweaters by Silversilk menswear. Silversilk puts nothing but unique head turning style and upscale quality into all of their designer sweaters. 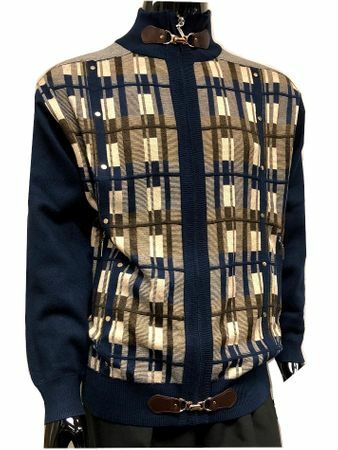 This navy fancy pattern sweater has a full fancy zipper and designer leather tabs for a unique look that just plain works. Made of silky rayon knit yarn.